The auditorium of Morse Recital Hall, with over 500 seats, was completely crowded by teachers and students of Yale University, who responded with cheers and applause to many of the songs interpreted by the Entrevoces choir, including El manisero, by Moises Simons, and the outstanding performance of the soloist soprano Ariana Rodriguez. 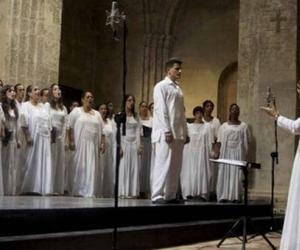 At the end of the presentation, the audience that filled the room stood up, incessantly clapped and asked for more songs to the choir, which, indulging requests played La Guantanamera in choral version of Electo Silva. In the coming days the Entrevoces choir will continue its journey by other cities in the US geography, including New York, Minnesota, Kentucky, Chicago, North Carolina and Washington, among others.